I’ve never been a big fan of anniversaries for bad days. Mostly because there is so much insincerity; dozens of media people trot out false sorrow and sympathy on camera, then return to a life filled with self-indulgence and narcissism. The same, unfortunately, can also be said for most of our elected officials. What makes today worse is that so many of these people miss at least part of the message. Some will miss it completely, as we hear from apologists and America-haters, who are best ignored for this article. But what I mean for here, is that we will hear about the victims (as we should), the heroism of Flight 93’s passengers and the first responders (again, quite right), tinged with the sub-rosa hints that no one should be blamed for what so many call “tragedy”, rather than face the truth. 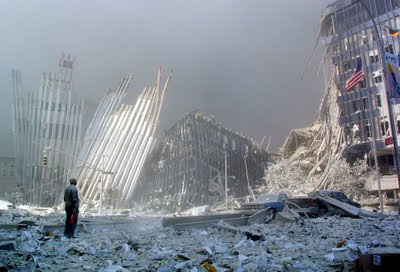 The truth is, ten years ago today the United States was suddenly and viciously attacked by members of an evil cult, which continues to exist and which enjoys support, but overt and tacit, for its mission against America, her citizens and values. While many of this cult have been hunted down and killed, there remains a vital mission to exterminate not only Al Qaeda, but every similar group and their supporters. This imperative is apolitical, permanent, and indisputable, although we can assume safely that there are plenty of Nimrods who will play politics with the issue, try to pretend this is history rather than a present danger, and play the denial card past its limit. When you target innocent Americans on U.S. soil, you forfeit everything you have and are. We will find you, we will kill you, and this will not end as long as your group exists. Remember. Remember who did this, and what needs to be done. There is no moral equivalency, no need to ‘try to understand’ terrorists, no reason to forgive.